Business travel is tiring even for relatively short trips. The work of moving through airports, dealing with delays, handing your baggage, finding transportation at your destination city and getting to the meeting are a much greater stress than you ordinarily go through doing business at home. 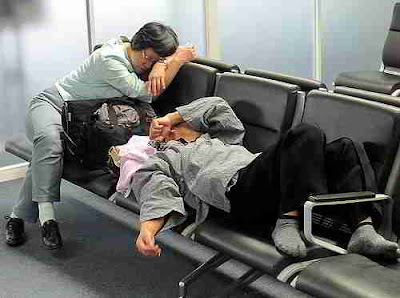 But when you add the problems introduced by jet lag, you face physical distress that can almost feel like you are becoming ill as your body reacts to the long distance travel. Start adjusting in advance. If you can put yourself on the time frame of your destination a few days in advance, the jet lag won’t be as severe. Start adjusting your sleep times and when you take your meals even before the trip begins so you are already “living in that time zone” before you even make the trip. Keep a clean diet. Jet lag experts advise that you simplify your diet significantly for several days before the trip. Begin to reduce the amount of heavy foods, carbohydrates, sugars and fats in your diet and increase the level of fruits, vegetables and juices you consume. This will make your system more nimble and able to adjust to change. Give yourself time on the other end. Try to make arrangements to arrive a day before your meetings so you have time in your hotel room to rest and prepare for the business objectives to be achieved. Eliminate physical stress sources. During the stressful time, try to cut down on physical stresses such as drinking or extreme physical exercise so your body has more reserves to handle the jet lag symptoms. By thinking ahead about jet lag, you are taking the measures you need to take to eliminate a threat to the success of your business goals on this trip. So your work to take jet lag out of your business travel equation is just good business on your part and it will result in more success on the road for you and for your company.